In need of a “wow” moment? 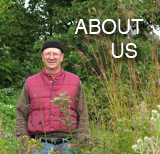 Then click on over to greenroofs.com for some unearthly photographs. If Linda Velazquez’s Earth Day Photo Contest winners don’t rock your paradigms, I don’t know what will. Linda’s most recent selection for Greenroof Project of the Week (GPW) profiles the American Society of Landscape Architects Headquarters in D.C. Following is a preview of what that building offers. Proof that the built environment doesn’t have to displace habitat — just take it to the next level.